Imagine you set sail for a three hour tour. Let’s say from the Port of Escondido (work with us here). The weather started getting rough. Your tiny ship (but not lunch, thankfully) was tossed. 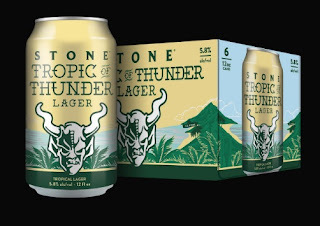 Long story short: You’re marooned on a remote island somewhere near the Tropic of Thunder. The good news is that the Capt. of the S.S. Stone and her brewing kit were among the small cast of colorful characters that survived the rough voyage with you. Mainstays Citra & Mosaic along with newcomer Cashmere hops are joined by their juicy tropical aromas of citrus, pineapple and coconut (try stringing all that together in a catchy tune). The rescue ship will find you all soon enough. For now, set aside the non-working cell phone and lack of social media (again, work with us here), kick back and revel in your moment of tropical island lagoon serenity.